Pete the Cat is off for a walk in his brand new white shoes, and he feels like singing. 'I love my white shoes...' But can he keep the music flowing if his shoes aren't so white any more? Pete the Cat is off for a walk in his brand new white shoes, and he feels like singing. 'I love my white shoes...' But can he keep the music flowing if his shoes aren't so white any more? 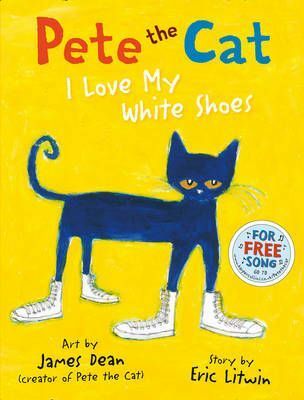 Pete the Cat is feeling good in his brand new white shoes, just walking along, singing his song. 'I love my white shoes, I love my white shoes...' Groovy! But when Pete steps in some strawberries, some blueberries, and some mud, his shoes aren't so white any more! But even without his white shoes, Pete the Cat is all good...Pete the Cat is a NYT bestselling character guaranteed to keep you feeling good, and with a free song, you can sing along too!